Working day and night, a group of diligent employees in the deep waters of the Arabian Gulf recently, and successfully, demothballed the Zuluf Gas-Oil Separation Plant 3 (GOSP-3) after several months of hard work on the plant’s platforms. 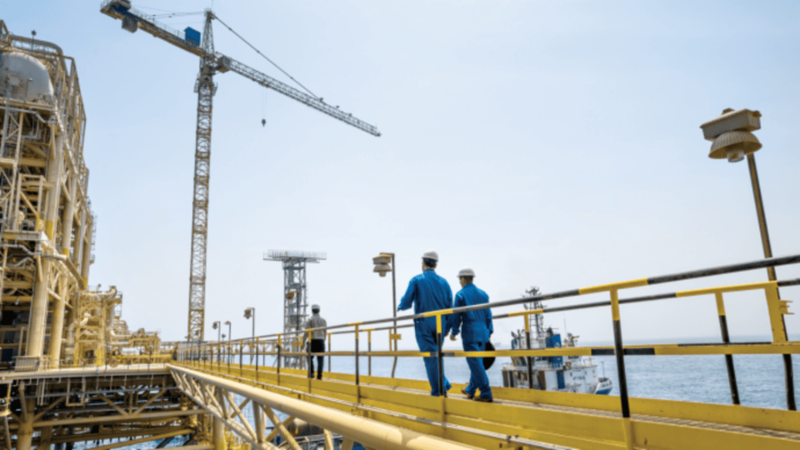 Led by a team from the Safaniyah Offshore Producing Department (SOfPD), the plant was brought back online after a 21-year hiatus of operations in the Zuluf field, which was discovered in 1965. 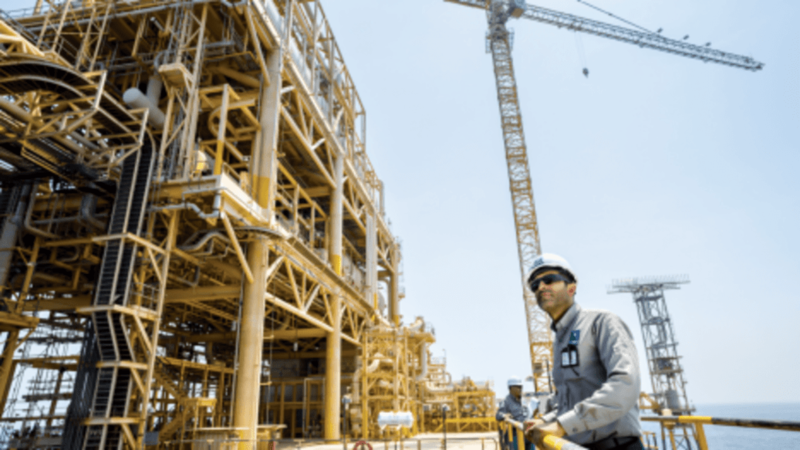 As part of Saudi Aramco’s continuous efforts to manage the Kingdom’s resources for maximum value, the company suspended GOSP-3 in 1995, as there was low demand for Arabian Medium crude oil at the time. But some two decades later as part of the same efforts, company management determined that the plant should be brought back into service. After a thorough study and evaluation of GOSP-3, it was determined that weather conditions in the harsh marine environment of the Gulf had made it economically disadvantageous to simply bring the existing GOSP back online. Much of the equipment, instruments, and devices on the GOSP had rusted out and become unfit for operation. SOfPD went to work in August 2016 to demothball the plant with a goal of completion in 12 months. “The plan was drawn up to achieve work of the highest quality in the shortest time possible and at the least cost,” said Khalid M. Al Khalb, SOfPD manager. However, a growing demand for oil prompted the department to expedite the project’s execution. Still committed to its usual highly disciplined approach and commitment to the highest standards of safety and quality, work continued around-the-clock to complete the project and meet the company’s needs. 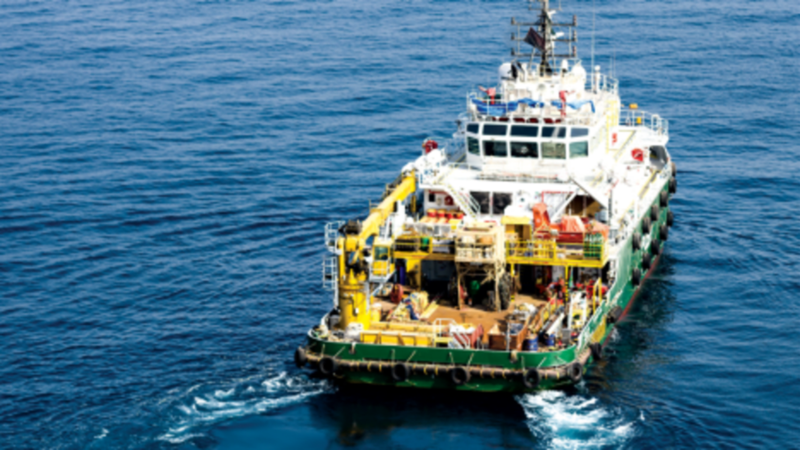 Abdullah A. Al-Salam, a senior operation adviser for SOfPD, noted that Saudi Aramco Maintenance Barge No. 1 at GOSP-3 was among those at the ready to provide the needed support to meet the plant’s and the company’s needs. Working diligently to help maintain and repair equipment and pipes for the plant, the team managed to repair more than 35 motors, pumps, and 2,200 valves as part of its role on the project. Maintenance boats such as these provide critical services for the GOSP and the equipment at the plant. Meanwhile, the team also renovated the residential platform and provided all services at the plant to ensure that the workers were living in a conducive environment. This included printing operation manuals and providing lessons to operators — along with help from the training unit in Tanajib — to ensure safety above all else. In the end, efforts such as these helped the team bring GOSP-3 back online by May 19, 2017 four months ahead of schedule. And the plant continues to carry out its work — separating gas from oil and pumping it to Safaniyah onshore plants for further processing. The capacity of the plant is 250,000 barrels of oil and 100 MMscf of gas. Saleh A. Al-Shahrani walks up the stairs to follow up on his required tasks on the Zuluf GOSP-3 platform where the gas is separated from the oil and then pumped to Berri and Safaniyah. Saleh A. Al-Shahrani, operations foreman at GOSP-3, first worked as an operator at GOSP-3 before becoming a unit head and operations foreman. He works in the depth of the sea throughout the week and looks forward to spending weekends with his children. 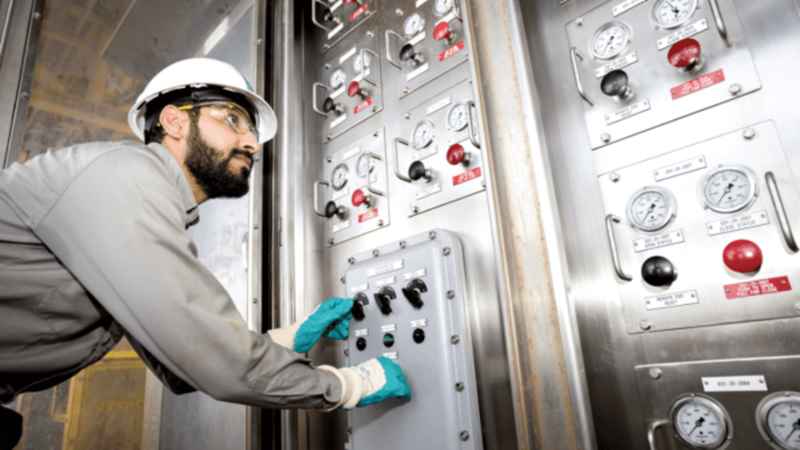 Like others on GOSP-3, Al-Shahrani is part of a team that helps separate gas from oil, and with normal pumping, sends 140,000 barrels of crude oil per day to Safaniyah onshore plants for further processing. When needed, they can pump 220,000 barrels per day. All of Zuluf’s four GOSPs produce about 700,000 barrels of oil per day. 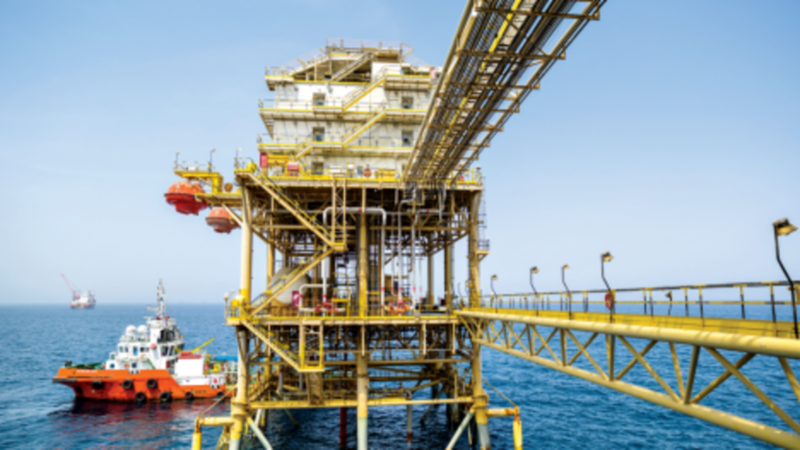 If pumps are operated, production can rise to 800,000 barrels per day — among the world’s highest production rates for an offshore plant. 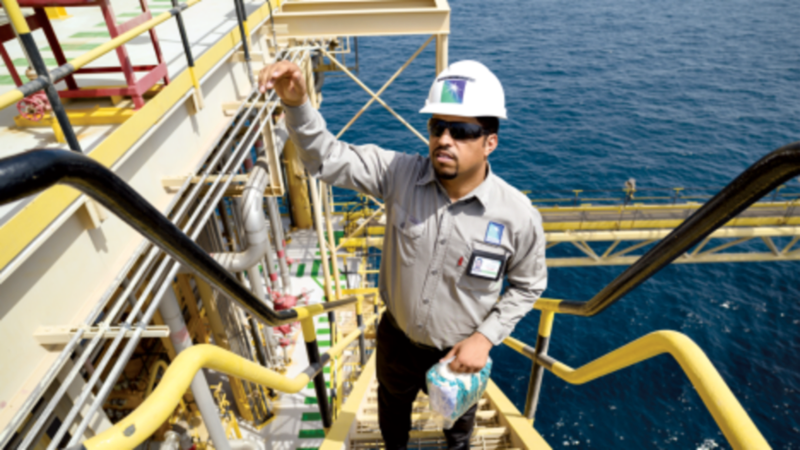 Saudi Aramco makes safety a priority in all of its facilities and plants. In accordance, operators at GOSP-3 must take specific measures during their 12-hour shifts. Operators are responsible for all equipment, instruments, and devices at the facility. Each shift is manned by six employees, including the head of the group, an employee in the control room to monitor all operations, and four operators. The plant itself is designed for safety, as well. Huge escape survival capsules are located outside the control room, each a rescue boat that can carry 50 people to safety in case of emergency. Abdullah A. Al-Salam watches closely the activity of his group from Saudi Aramco Maintenance Barge No. 1 on Zuluf GOSP-3. Al-Salam, an electrical engineer, began working for the company in 2005. He first worked in the Safaniyah Onshore Producing Department before moving to SOfPD. 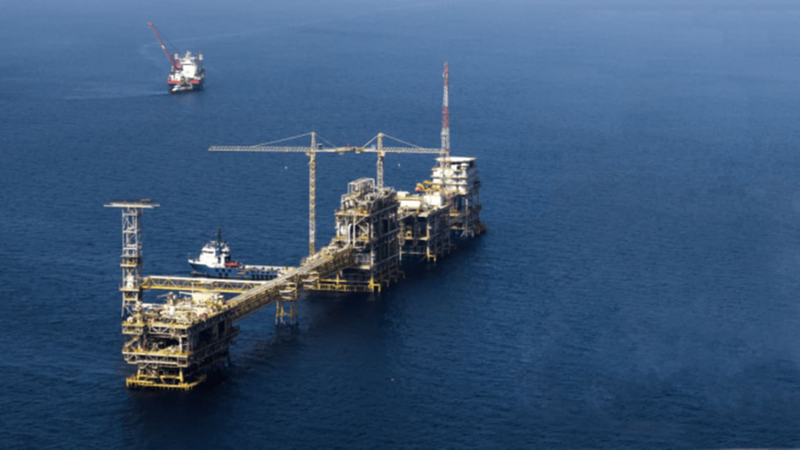 In 2014, Al-Salam moved to the Marjan offshore oil field as head of the operation unit. Two years later, he moved to Zuluf’s GOSP-3, which is a two-hour journey by boat from Marjan field. Al-Salam, says his passion for electricity can be traced back to his childhood when he used to watch his father fix electrical devices at home. For him, it became a hobby that transformed into a career. Al-Salam says working and living on the marine platforms is very challenging to the employees, especially those who worked to demothball GOSP-3. With residential platforms rising five stories — two for housing and three for support services and each story able to house as many as 100 employees, conditions are amenable. The huge employee residential platform consists of two stories with 44 rooms each. About 65 employees currently work at GOSP-3. Huge pumps and tanks of desalinated water for drinking, bathing, washing, and cooking are available on the platforms. There are also tanks for firefighting water and foam. Working with a competent team of 48 workers (24 operators, 20 maintenance technicians, and four engineers) on this important project helped make it easier to work, he noted. In his free time, Al-Salam spends time socializing with his colleagues with whom he feels strong ties. On his days off, he spends time with his family. Employees move from one platform to another by using ladders with as many as 1,000 rungs, and then an iron bridge from which they could see the blue water beneath. The platform is 65 meters above sea level; the depth of the water is 50 meters. The control room is the throbbing heart of the plant. Turki S. Al-Sharari, a recently married young man who works in the control room as an oil and gas operator, notes the work is simultaneously significant and sensitive. Following up on his work on multiple computer screens, Al-Sharari finds his work interesting. In his off time, he enjoys reading history, exercising, and soccer. His colleague Ali H. Al-Janabi works as an operator and safety officer. A part-time student who also likes reading, particularly Shakespeare’s plays, Al-Janabi also likes diving. He was passionately involved in the reactivation of the plant, which provided him significant experience. Dhaifallah A. Al-Ghamdi, a shift supervisor at the control room, said he decided to join Saudi Aramco because it was a great opportunity. In his current role, Al-Ghamdi must work hard and has many obligations to his team, including close follow up of work, maintenance and equipment, instruments and devices, and ensuring implementation of safety standards and training of young colleagues. Al-Ghamdi, who likes to spend time with his children on his days off and also likes to play soccer and swim, says he feels rewarded by the challenges of work, including the speed and accuracy needed for the completion of work, thinking outside of the box, and good practices to find solutions to technical problems. Hussain M. Al Ibrahim, a 2014 graduate, first worked at Zuluf’s GOSP-2 before moving on to GOSP-3. He focuses on his work of monitoring pipelines and the work of contractors and takes care of safety tools, working in the control room when needed. 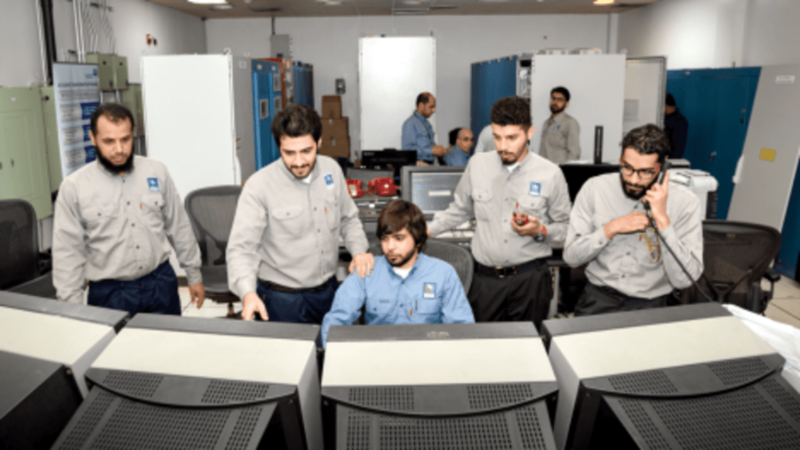 An adviser in the control room, Al Ibrahim said he likes his work because he is serving his homeland through increasing energy production needed throughout the Kingdom. Ali H. Al-Janabi monitors operations through a set of gauges aboard Zuluf GOSP-3. He is one of dozens of young employees who are responsible for the operation of the offshore plant in the waters of the Arabian Gulf. When you listen to Hussein S. Al-Dubaisy speak about his passion for classical music, particularly the violin, you will first think that you are in front of a young composer or musician. The truth, however, is he works as maintenance planner for SOfPD. Al-Dubaisy currently studies business administration at King Faisal University as a part-time student and is expected to graduate in 2018. He spends his weekdays off among his family or traveling. Al-Dubaisy participated in the demothballing project as a maintenance officer. He must review all materials that enter or leave the plant. Al-Dubaisy also prepares procurement orders and follows them up step by step until their delivery. Hussein S. Al-Dubaisy, a maintenance planner, loves both his time at work and away, where he is a part-time student who has a clear passion for classical music. Like all those who have participated in the Zuluf GOSP-3 demothballing project, he is proud to have put in hard work and overcome significant challenges in meeting company goals, responding to the call of duty of the Kingdom and the need to deliver more energy. Saudi Aramco is the state-owned oil company of the Kingdom of Saudi Arabia and a fully integrated, global petroleum and chemicals enterprise. Over the past 80 years we have become a world leader in hydrocarbons exploration, production, refining, distribution and marketing. Saudi Aramco’s oil and gas production infrastructure leads the industry in scale of production, operational reliability, and technical advances. Our plants and the people who run them make us the world’s largest crude oil exporter, producing roughly one in every eight barrels of the world’s oil supply.